For the serious collectors that missed out on a rare opportunity. These original cigars have been graciously ageing under personal care and attention for almost 5 years now! 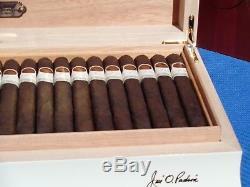 The cigars are a very exclusive blend, crafted from special tobaccos that have been aged to a minimum of 10 years. This unique blend is available in a single vitola of 6 1/2' x 52, with a maduro wrapper. As with the ultimate, hand crafted, furniture finished humidor (its surface is like a grand piano), the cigars themselves are a masterpiece in craftsmanship, showcasing some of the most refined and complex flavors you will ever experience - this is not simply a profile that can be laid out on paper. There were only 1,000 humidors produced, each being individually numbered and had arrived with a certificate that had to be registered online. 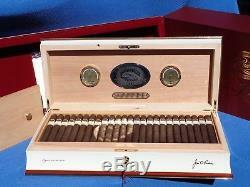 Padron then notifies the registered owners when re-fill cigars become available (only once a year). Of course, 2014 was a landmark year for Padron, as it marked their 50th Anniversary. 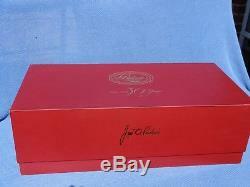 To celebrate, they released this limited production of the Padrón 50th Anniversary Edition Cigar and Humidor. A real cut above other special edition cigars, Padrón spent years planning and manufacturing this special release, from this beautifully designed humidor (considered one of the best humidor designs ever made) to the incredible cigars themselves as this release is truly unparalleled. 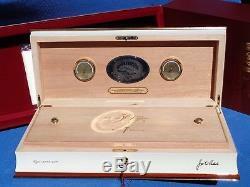 Custom designed and eloquently finished Padron humidor number 187 of 1,000 made and distributed worldwide. 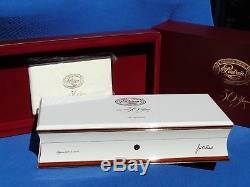 33 original 2014 Padron 50th Anniversary limited edition cigars. 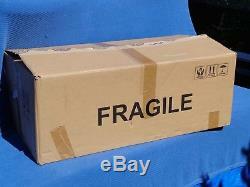 (having been meticulously nurtured and aged) and. 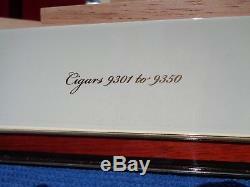 Red numbered for humidor 187 (see photos). 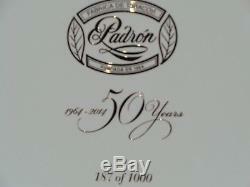 17 re-fill 2018 Padron 50th Anniversary limited edition cigars- black numbered for humidor 187 (see photos). White with gold lettering ownership program & number documentation booklet, clean & unopened in the original wrapper (see photos). 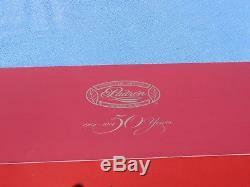 Original burgundy and gold lettered product presentation container (see photos). 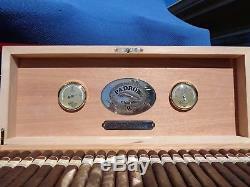 In some cigar photos you will notice a reflection (glare) from the Padron nameplate. The item "PADRON 50th ANNIVERSARY HUMIDOR With ORIGINAL 2014 RED-NUMBERED CIGARS" is in sale since Sunday, October 21, 2018. 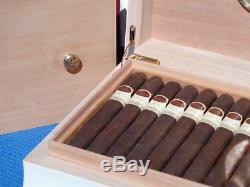 This item is in the category "Collectibles\Tobacciana\Cigars\Humidors\Contemporary". 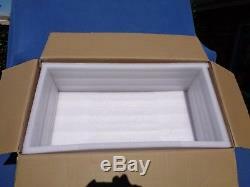 The seller is "bopp_52" and is located in Allen, Texas.